Start here to make your project a success! 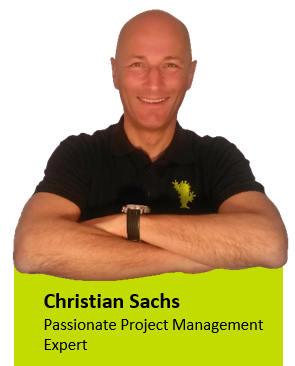 Make Projects Successful with Christian Sachs. Great. I’m glad you’re here. My name is Christian. Our mission at Cactus Competence is to help you to take your project from the beginning to successfully reaching your goals having more fun and less stress. Everyone who wants to achieve an objective, either as an entrepreneur, project manager or employee, better rely on good project management instead of good luck. We do not only simplify project management but also use exclusively methods we have stress-tested ourselves, that everyone can understand and that actually do the job. I’ll coach you on-line and via email and Skype, so that you can join me wherever and whenever you may need me. You can find my best tips, tricks and tools here on my blog. I’ll send you my tips and tricks for more fun and less hassle with your projects (not more than once a week). I guarantee I’ve stress-tested them all by myself. Always following my rule: It needs to be simple, otherwise you are not going to do it. Sign up for my free project management updates! With your subscription to my updates, you’ll get access to my free downloads. Wanna know what downloads you’ll get? Here you can go directly to the tools page. Get familiarized with our virtual company “Hotair Ltd”! What is a project? … And what is not? Get involved and comment my posts on my Facebook page or discuss in our Facebook Group! Contact me on my LinkedIn profile! Then please skip step 1 to 3 and go directly to Project Coaching! I’m looking forward to meeting you.